Today’s market has an abundance of new and used diesel generators for potential buyers. 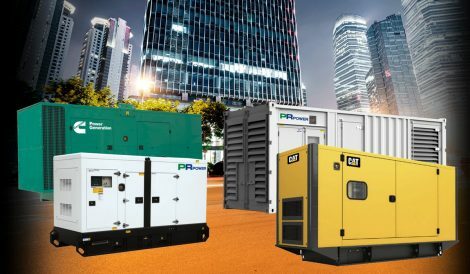 The usual buying process starts with identifying a need, for example to power a site or to provide emergency backup, prime or standby power. Next is the research on what specifications and requirements are needed for the specific site. Finally it comes down to buying a new or used generator. This article will lead you in the right direction so you can make an educated decision that is right for you. Standard Manufacturer Warranties are a huge advantage with any new piece of equipment and yet, they are still one of the biggest oversights when purchasing a generator. A good manufacturer’s warranty on a genset should last at least 12 months (24 months if it is a standby unit) and will include full parts & labour cover). This means the whole generator and any labour needed towards the generator are covered within the warranty time. So always review the warranty before purchasing and be wary of warranties which will only cover the engine or certain components of the generator. Unfortunately lead time is something which will usually take a hit when purchasing larger generators. It varies through different manufacturers, but a general rule is the larger the size of the generator the longer the lead time will be due to the limited availability and assembly process. To avoid lead time delays, PR Power has a stock of new generators available ranging from 15-2250 kVA. Some of the smaller sets can be ready for delivery in less than a day and the larger ones in less than 5 working days. When purchasing a used diesel generator there are risks. However, you may be willing to take this risk due to the savings that can be made. To reduce this risk, the used generator you wish to purchase should be load tested providing a full report and as much information about the generator as possible. Our recommendation would be a 12 hour load test. The secret when looking for used equipment is to look for the units with low operating hours. In this case, keep an eye out for the generators that have only been used for emergency backup or standby power. At PR Power, our used equipment options also extend to our rental fleet. All equipment is maintained and tested, filled with fuel and complete with operating manuals prior to leaving our premises for hire. In addition, onsite training on the correct operation is provided on request to ensure the health and safety of our clients when operating our equipment. There are many things to consider when purchasing a new or used generator set. Your decision will be based on your site requirements and your budget whilst weighing up all the pros and cons. The team at PR Power are here for any questions you may have and will help you step by step in finding the right piece of equipment for your circumstance. For further information, contact us today.